The history of these monuments are mysterious: I'll call it the tale of three columns. Two are souvenir monuments with the same name, but they look different. 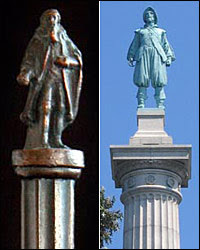 The third is the real Henry Hudson Memorial Column whose figure looks very different than that of the souvenirs. After researching the history, I believe the column was built, but due to financial problems, the statue on top was installed many years later and with a different design from what was originally planned. One souvenir of the memorial is made of bronze with a square base which reads, ‘Hudson-Fulton Celebration Official Banquet Sept. 28 1909.’ Under the base, a maker’s mark reads “A. Furst Caterer, N.Y.” On top, the figure of Hudson is that of an old man donning a long beard, long coat and pointing into the distance. The second replica is in the Monumental Miniatures book (# 143) and has a large round base and column, but no figure on top. David Weingarten said regarding his souvenir, "I believe there was a figure on top originally, now lost. The base of ours reads “Hudson-Fulton Banquet Hotel Astor Sept. 29th 1909.” Cast in underneath the base is, I believe, Whitehead & Hoag, the maker. Some of this mark is obscured. On the base, at what I take to be the front of the monument, is an inset panel with a very schematic image of a sailing ship on water with a shoreline in the foreground." It’s too bad the figure is missing on top. What did the figure look like? It’s clear the souvenirs were made by different companies, for perhaps two different banquets because the dates are one day apart (28 & 29). The Hudson-Fulton Celebration lasted 2 weeks and featured many events. Adding to the mystery, the design of the real Henry Hudson Memorial Column, located in Spuyten Duyvil in the Bronx borough of NYC, has a different style figure on top. The real memorial’s Hudson figure is a younger sea captain “clad in seafaring garb and stands as if balancing on a ship’s deck.’ The monument is named for explorer and navigator Henry Hudson, and pays tribute to the man who explored the river beginning in 1609. Henry Hudson explored the great river which was later named for him. Guiding his ship, called the “Half Moon,” he entered what is now New York Harbor and sailed up river. In his log book, Hudson wrote, “On that side of the river called Manna-hata, we saw no people to trouble us and we rode quietly all night.” Much later, in August 1807, the inventor Robert Fulton traveled up the Hudson River at a speed of five mile per hour in his steamboat, the Clermont. From September 25 to October 11, 1909, the State of New York commemorated both the 300th anniversary of the discovery of the Hudson River by Henry Hudson and the 100th anniversary of the first successful application of steam to navigation upon the river by Robert Fulton. Called the “Hudson-Fulton Celebration,” the extravaganza was held in New York City and on the Hudson River. Thousands participated with parades, exhibits and re-enactments of the earlier voyages. Plans were made to erect a monument to Hudson and to construct a Hudson Memorial Bridge linking the Inwood district of Manhattan with Spuyten Duyvil in the Bronx. Funds were raised, a site was donated and in 1909, ground was broken for the memorial. The project encountered multiple delays, but the 16-foot Doric column was set in place in 1912. Shortly afterwards, however, funds for the project ran out. Originally, Karl Bitter prepared a plaster model of a Henry Hudson figure, but due to a lack of funds this portion of the project was postponed. A few years later, Bitter died and the plaster model disappeared. The project was revived by Robert Moses in the late 1930s. Sculptor Karl H. Gruppe, a student of the original designer Bitter, redesigned the figure of Hudson and created the two bas-reliefs for the base of the column. The statue of Henry Hudson was finally placed on the column on January 6, 1938 and the area around the monument had been designated as a park.Clad in seafaring garb, Hudson stands as if balancing himself on a ship's deck. From his elevated position, Henry Hudson continues to keep watch over parkway and bridge and the ever-changing landscape along the river that bears his name. In 1989 Henry Hudson Park underwent a capital reconstruction which included new playground equipment, restoration the monument plaza, and improvement to the paths and stairways. Wow…this is one of the longest posts I’ve written and it required the most research to date. Conclusion & Theory: I believe the 1909 souvenirs were prototypes of the design as planned. After many unusual circumstances and 26 years later, the memorial’s Hudson figure was finally completed, but with a very different design from the original.This story from the NY Times in 1909, discusses how a fad for banquet souvenirs peaked at the Hudson-Fulton Celebration. Attendees must have been crazy for memorabilia. I've found references to souvenir bronze coins and souvenir spoons made by Tiffany & Co. for the celebration. It’s very possible multiple makers and designs were created of the monument’s souvenir replica. 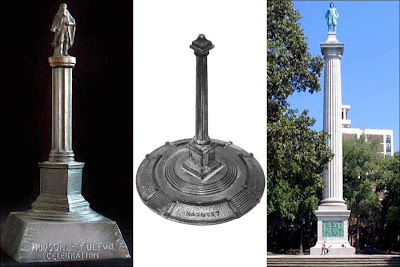 Do you have or know of other souvenir replicas of the Henry Hudson Memorial Column? If so, let me know if the figure matches my monument or the real monument.